The Valencia season 2015 has started! BIOFACH 2015: Biocyclic olive oil received again a recommendation! Since 1996, in Kalamata, under the direction of Dr. agr. Johannes Eisenbach, biocyclic compost is produced on the basis of olive pomace and olive leaves. The quality compost prepared using the Lübke-Hildebrandt method is purely of plant origin and is distributed to the networks’ farmers all over Greece, in order to provide a biologically active substrate which offers soil improvement, especially in the first years of reconversion, as well as a basic fertilisation for trees and greenhouse cultures. In addition, since 2003, part of the compost has been treated in a special way to obtain biocyclic humus soil, a purely plant based, nutrient- and carbon-stabilized (no water-soluble nutrients = groundwater protection together with permanent CO2 binding = contribution to climate protection) compost substrate with an extremely high fertilizing effect. Building a soil environment without water-soluble plant nutrients leads to the activation of a nutrient absorption mechanism independent of water uptake, which has a positive effect on restoring natural soil fertility. It should be emphasized that humus soil, whose measurable characteristics are currently formally defined in a scientific discourse, does not have to be classified as compost or soil conditioner, but as a kind of soil. The widespread use of humus soil in large quantities (200 tons per hectare and more) is neither harmful to the environment nor to plants, but on the contrary beneficial for the development of plants of all ages, no matter if they have a high, middle or low demand of nutritional elements. Field trials showed that the plants extract only those nutrients from humus soil they specifiacally need according to the stage of development resulting in an optimal nutrient supply throughout the vegetation period and better yields than usual even in comparison with conventional farming. Moreover, this way of "fertilization" is environmentally friendly given that the stabilized carbon structure results in long-term CO2 binding (carbon bound in humus soil can not yet be returned to the atmosphere through further microbial degradation processes) and avoides at the same time any form of groundwater pollution (since all nutrients contained in humus soil are present in a non-water-soluble form). The production and use of humus soil as a substitute for fertilizers and other preparations of animal origin plays a central role for plant nutrition and plant health in biocyclic vegan agriculture. The particular properties of humus soil are currently being investigated in a series sxxientific trials at the Agricultural University of Athens with the support of the National Agricultural Research Foundation N.AG.RE.F.. First results prevailing an astonishing increase in yields for sweet potatoes and industrial tomatoes are already available. 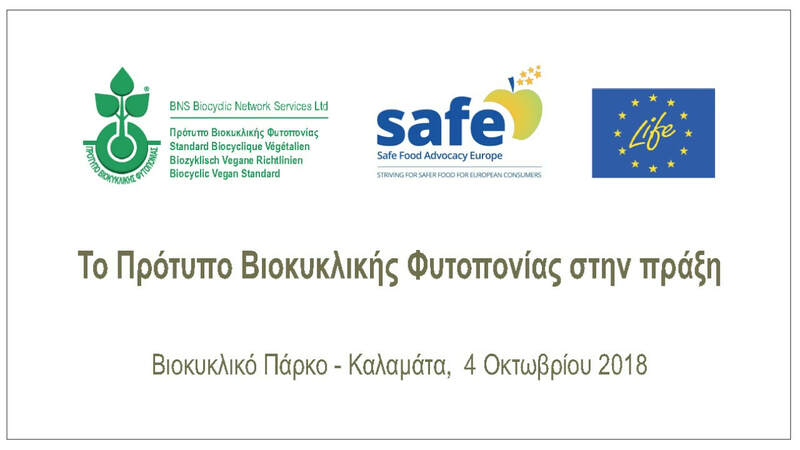 At 'Biocyclic Park' – the only compost plant in Greece which produces compost and humus soil certified for organic and biocyclic vegan farming by CERES – vegetables like rocket, beet roots, Hokkaido squashes, broccoli, cabbage, basilicum and ginger - all certified both, organic and biocyclic vegan, by BIO HELLAS (GR-BIO-03) are cultivated directly on compost and humus soil windrows, a method which has been introduced by Adolf Hoops, a pioneer of organic farming with decades of experience in vegetable production in Germany (Walsrode). If used in an earlier stage of ripeness (e.g. as compost substrate) the temperature which is produced during decomposition of organic matter within the windrows, allows even frost sensitive vegetables to be grown in Kalamata in open air also in winter. Furthermore, in “Biocyclic Park” seminars are held regarding compost preparation techniques as well as a general introduction in how to implement the Biocyclic Vegan Standard in every day organic farming practice. © 2019 by BNS Biocyclic Network Services Ltd.